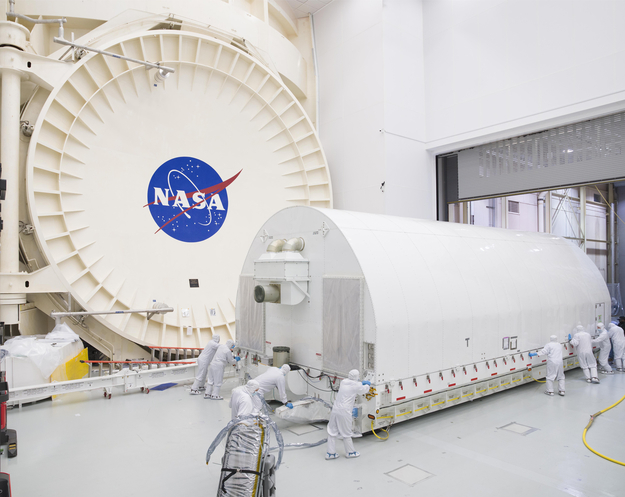 Engineers pushing the Space Telescope Transporter for Air, Road, and Sea (STTARS) outside the Chamber A clean room at NASA's Johnson Space Center, Houston, on 28 January 2018. Inside STTARS was the optical telescope and integrated science instrument module (OTIS) of the James Webb Space Telescope, which had recently completed cryogenic testing within the chamber. OTIS was transported to Northrop Grumman's Space Park facility in Redondo Beach, California, where it arrived on 2 February.